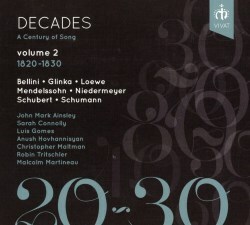 In 2016 I welcomed the first release in a projected 10-volume series of discs, each of which will cover a decade of songs composed in the century between 1810 and 1910 (review). The intention is to create a comprehensive survey of song right through the nineteenth century and it will feature a variety of singers and composers. Some of the composers will be very familiar and their songs will be placed alongside composers whose songs are much less well known. The series is to be curated by Malcolm Martineau and having enjoyed the first instalment I was delighted to receive its successor for review. This new disc gives opportunities to some singers whose work may not be familiar to some collectors. I’ve encountered the British tenor Robin Tritschler both live and on disc. However, the Armenian soprano, Anush Hovhanissyan was a new voice to me – she’s to represent her country in the 2017 Cardiff Singer of the World competition, I understand. Similarly, I had not previously heard the Portuguese tenor, Luis Gomes. Both he and Miss Hovhanissyan have been members of the Jette Parker Young Artist Programme at the Royal Opera House, Covent Garden while Tritschler is a former BBC Radio 3 New Generation Artist; so all of them have good pedigrees. These three singers offer us some of the less familiar music in this programme. Anush Hovhanissyan has the three Glinka items. These are salon romances, dating from 1824-28. As Susan Youens tells us in her notes, the salon romance was “a type of often sentimental art song unique to Russia and developed in the early nineteenth century.” I’d not heard these pieces before. I don’t think I’d describe them as distinguished examples of art song but they’re worth hearing. Miss Hovhanissyan does them well, making very good use of the words and her expressive voice is well suited to them. Luis Gomes is allocated the trio of items by Bellini. I must say I’d never thought of him as an art song composer. Prof. Youens says of them that “if they are trifles, they are exceedingly elegant ones.” I’m afraid I’ve never found Bellini’s operas remotely to my taste and despite the ringing advocacy of Gomes it seems to me that “trifles” is the mot juste. Still, that’s a highly subjective response and I’m sure that other listeners will respond more positively. The other unfamiliar piece is Le lac by the Swiss, Louis Niedermeyer. I knew of him in connection with the École Niedermeyer in Paris where Fauré studied but I confess that I was ignorant of his music. I was also unaware of the important place that Susan Youens ascribes to him as a man who “revitalised French song; breaking the mould of the old-fashioned strophic romance he composed songs to words by the foremost poets of the time”. Le lac is ambitious in scale and it impressed me. In the early stanzas of the poem Niedermeyer writes in a big, almost rhetorical style but later on the music becomes more relaxed and lyrical. Robin Tritschler makes a very good job of it and his vocal timbre is well suited to singing in French. The ballads of Carl Loewe received the advocacy of no less a singer than Dietrich Fischer-Dieskau. Comparisons are inevitable between his setting of Erlkönig and the version by Schubert. Loewe’s piece lacks the demonic rhythmic urgency of Schubert’s composition - what a masterstroke that was by Schubert! – but Loewe still commands attention and he relates the story well. Christopher Maltman is a gripping narrator. He’s also vivid in the way that he unfolds the narrative of Herr Oluf, another ballad that ends with a corpse. And it’s Schubert whose songs bookend this programme and which, frankly, put the other songs in the shade. When Im Frühling begins the piano part and light, easy vocal line might suggest we’re in for a song that is simply charming. However, Schubert’s effortless major/minor shifts give the song a lovely air of tender melancholy. John Mark Ainsley sings it beautifully while Martineau imparts a winning delicacy to the piano part. The next two songs show Christopher Maltman at his best. Auf Heliopolis I is a Mayrhofer setting and in the notes Susan Youens speaks of the poet’s “dunkle Lebensangst” (dark anxiety about life). Schubert’s music brings that characteristic out so well and the dark eloquence of the song is superbly conveyed by Maltman. Furthermore, the compass of the song allows us to savour both his lovely high notes and also the firm, dark brown sound of his lower register. He’s no less successful in Gondelfahrer. Here the nocturnal aspect of the music is expertly realised through Maltman’s highly expressive singing and the way in which Malcolm Martineau suggests in his playing the dark waters through which the gondola glides. At the other end of the programme Sarah Connolly is on peak form in the three Walter Scott settings. She’s poised and expressive in her delivery of Raste Krieger, Krieg ist aus. I loved her gorgeous tone and legato in this marvellous performance. She lavishes effortless vocal quality on the celebrated Ave Maria, which is serene and expressive. Der Winterabend, sung by Ainsley, is echt-Schubert. It’s a simply exquisite song and Ainsley’s lovely performance is very touching. To play us out, as it were, we hear Die Taubenpost. There’s absolutely no reason why this song shouldn’t be detached from Schwanengesang and it makes a very satisfying conclusion to this programme. The music seems effortless and Maltman and Martineau are perfectly poised in performing it. I enjoyed this disc very much. The singing is consistently good, no matter who is in front of the microphone, while Malcolm Martineau’s playing is as pleasing and insightful as you’d expect. Though the recordings were made over several sessions the same venue has been used and the sound is consistent – and good. The booklet is comprehensive with Susan Youens’ interesting and enthusiastic notes a particular pleasure. This is shaping up to be a perceptively assembled and uncommonly interesting survey of art songs. I hope we shan’t have too long to wait for the next instalment.